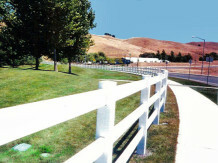 Bufftech’s Post & Rail fencing provides a safe, reliable enclosure for horses and other livestock. 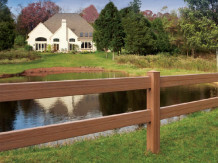 Post & Rail comes in two textures smooth and CertaGrain texture which offers the authentic look of painted wood fencing. Both smooth and CertaGrain textures are available in several different colors. Vinyl fencing is virtually maintenance-free, eliminating the hassle of painting, sanding and staining; not to mention eliminates the cost of replacing warped, rotted sections. Ideal for all climates has unparalleled fade protection from harsh ultraviolet rays. Arbor Fence both installs as well as sells this vinyl material, to purchase the material alone you can visit our online store at www.ArborFenceWebstore.com. A combination of beauty, durability and versatility. 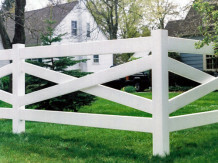 The Crossbuck is a decorative 4-Rail Fence with a 1-1/2″x 5-1/2″ rail size. Only color available is WHITE. 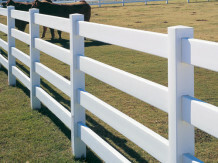 The 2-rail corral fence is a perfect additional to any lawn or garden area. It comes in two textures – Smooth and CertaGrain. These both are available in different colors. This is a simple fence to install, is long-lasting and maintenance free. A safe, reliable enclosure for livestock. No exposed hardware to harm your animals or pets and virtually maintenance free! Available in both smooth and the wood-grain textures. The ideal fence for horses and other large livestock. It’s durable, low maintenance and proven to performance makes this a safe and reliable choice. It is also available in CertaGrain texture – giving the vinyl an authentic look of painted wood fencing. © 1990-2019 Arbor Fence Inc. For all your fence construction needs!